Nearly all cyclohexane is used to make cyclohexanol and cyclohexanone, which, in turn, are used mainly as precursors for the production of adipic acid and caprolactam, respectively. Other uses for cyclohexane include various solvent applications and the production of cyclohexanol and cyclohexanone for nonprecursor use. As a result of cyclohexane’s intrinsic link to the polyamide chain and its use in automobiles, construction, and textiles, global cyclohexane demand remains strongly influenced by macroeconomic conditions. Cyclohexane is largely consumed for nylon 6 fibers, resins, and films. Around 2–3% of cyclohexane demand in 2017 is utilized in solvent applications. The United States, Western Europe, and China are the main capacity centers for cyclohexane; much of the global demand is driven by China. Cyclohexane is an oversupplied market and therefore the overall market is expected to exhibit slow growth in the next five years (2017–22). 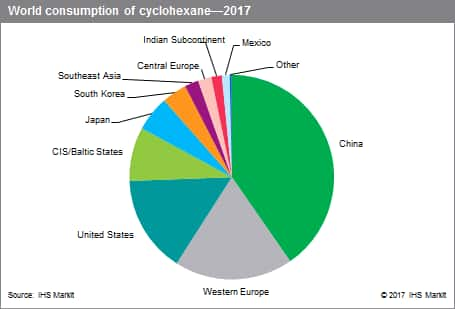 The top producers of cyclohexane are located primarily in the United States and Northeast Asia, accounting for 18% and 30% of the total capacity in 2017, respectively. The benzene hydrogenation process is used by almost all cyclohexane plants. In the United States, one plant used to recover cyclohexane from hydrocarbon streams at Borger, Texas. No cyclohexane is currently produced from NGLs as the plant diverged into making other products. Cyclohexane remains the dominant feedstock for caprolactam and adipic acid; however, phenol is also used to generate adipic acid and caprolactam. In 2017, China alone is estimated to account for 40% of total demand, mainly for caprolactam production. The US cyclohexane market is driven more by adipic acid, mainly for nylon 66 production. Regional demand is not expected to vary much in the next five years, and is forecast to adjust to the increased caprolactam availability in China. Overall growth in consumption is forecast to increase at 2.6% annually during 2017–22. Caprolactam is estimated to account for more than 55% of the total demand for cyclohexane in 2017; it continues to be the largest end use. New capacity for caprolactam is mainly phenol based, especially in China. This has affected the overall global demand for cyclohexane, which is expected to slow in the next few years. Chinese caprolactam capacity has increased at a rate of around 25–30% per year during 2012–17; that added significant momentum to cyclohexane demand. This rate of growth will not occur in forthcoming years because of the overcapacity of caprolactam and also because of increased use of phenol as a precursor to caprolactam production. Adipic acid is the second-most-important outlet for cyclohexane, estimated at 21% of demand in 2017. The United States, Western Europe, Japan, and China are the only consumers of cyclohexane for adipic acid. Uncoupled cyclohexanol/cyclohexane is estimated to account for around 20% of the total demand in 2017; most of it is used to produce caprolactam and adipic acid. Northeast Asia continues to be the largest market for nylon, although growth has slowed compared with previous years. In the United States and Western Europe, nylon demand continues to be lackluster as a result of reduced demand in fiber applications. Cyclohexane demand is directly affected by consumer demand for nylon applications. Despite mounting uncertainty, global demand for cyclohexane is forecast to grow at an average annual rate of 2.6%. Much of this demand growth will continue to occur in China; caprolactam is used in nylon 6 applications while adipic acid is used in nylon 66 and polyester-based hot-melt adhesives applications. Cyclohexane demand is affected by caprolactam overcapacity and additional derivative supply is likely to come through competing feedstocks (phenol). These two main factors continue to influence and impede strong cyclohexane growth.